Today, May 25, 2015 during a press conference at Omega Horse Rescue and Rehabilitation, Jon and Tracey Stewart signed the papers officially adopting Lily and Anita, another horse that had befriended Lily at the rescue. “She’ll be well cared for, and she’ll never want for anything again,” Jon Stewart said when the adoption announcement was made. 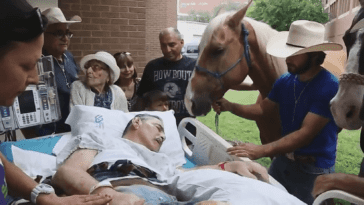 The two horses were transported to the 12-acre farm in New Jersey that the Stewarts have turned into an animal sanctuary. You can follow Lily and Anita in regular updates on the farm’s Facebook page, The Daily Squeal. Since the news broke in March, Lily has become an internet sensation for a very tragic reason. 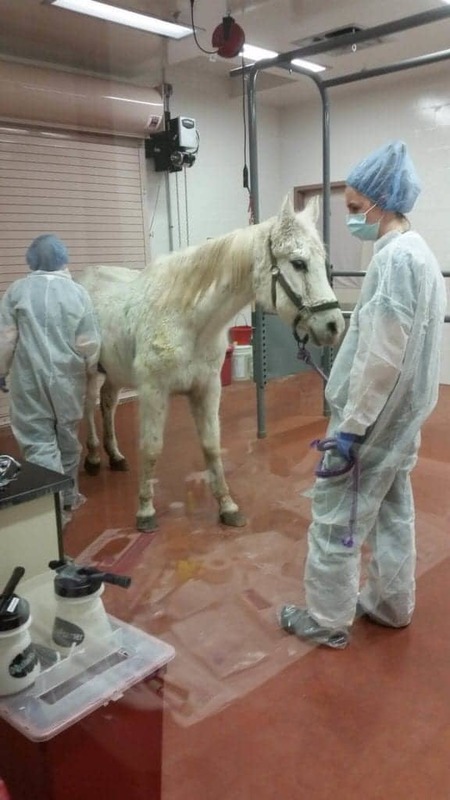 She was found at New Holland Sales Stables (a horse auction), skinny, battered, with infected eyes and covered in paint from what appeared to be more than 100 hits with a paintball gun. It is estimated that she is around 20 years old and an Arabian/Appaloosa cross. 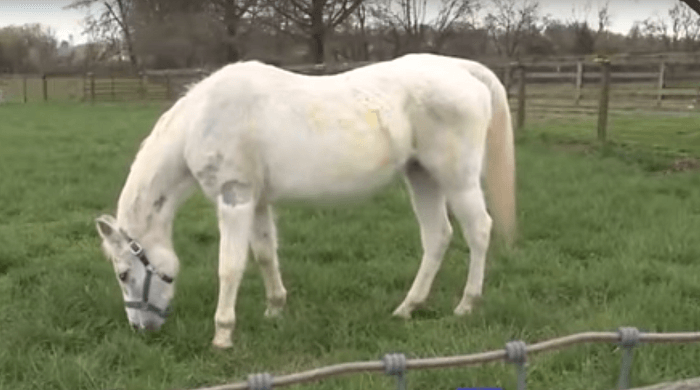 Philip Price, the New Jersey man who brought her to the sale yard in Pennsylvania, was convicted on Friday of three counts of animal cruelty and two charges related to handling a horse across state lines without proper licenses and health certificates. He must pay $10,178 for Lily’s veterinary care and an additional $3,056 in fines. However, Price was not Lily’s owner and there has been some debate on what actually happened to the poor mare. 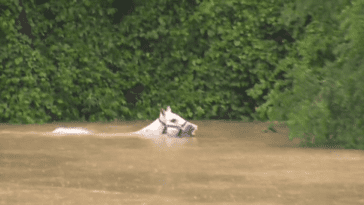 According to Pennlive.com, who interviewed Sue Martin, director of the Lancaster County SPCA, they believe she could be a mare that was used as a lesson horse for the past fifteen year’s at Smoke Hollow Farm. 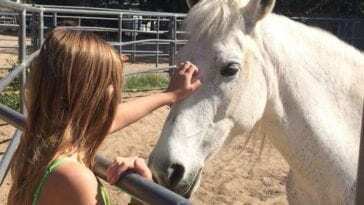 The owner of the farm, Doreen Weston, had in fact given Price an old white mare around the same time, whom she had “no more use for.” Like Lily, her mare suffered from eye and dental issues. 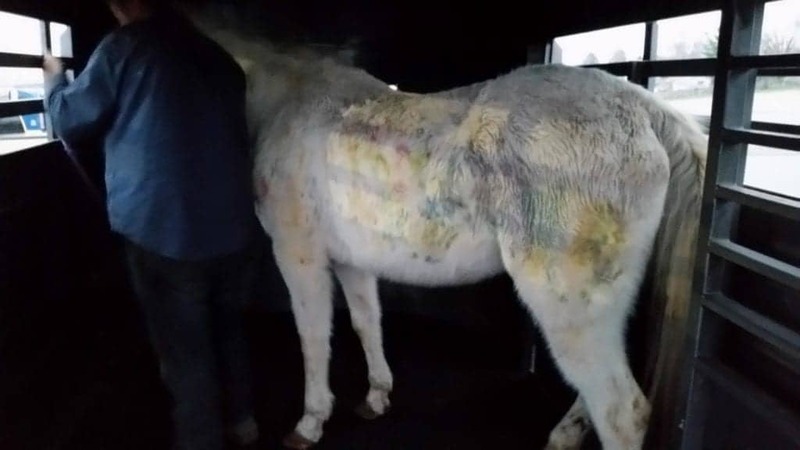 Even more compelling, however, is that she admitted her horse had paint on her too, though she claimed it was from kids painting on her with non-toxic finger paints during a birthday party. 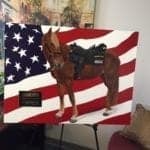 Yet Weston maintains her horse was a purebred polish Arab, and not a cross, and that they must be different horses. Unfortunately, we may never know the truth in order to hold the responsible parties accountable for what they have done. Whether or not justice will ever fully be served, Lily is making an amazing recovery. She has gained 150 pounds and, after surgery to remove an eye, she is doing great. But even better times are still ahead. 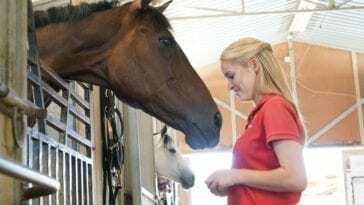 It was just announced by Omega Horse Rescue and Rehabilitation that Lily, along with another mare Anita, have both been adopted by Jon Stewart and his wife Tracey Stewart for their new 12 acre animal sanctuary. Anita and Lily are both missing an eye and have bonded to each other, the rescue says. Tracey had visited Lily in April while she was recuperating at the Penn Vet New Bolton Venter in Kennett Square, Pennsylvania. We are so thrilled Lily and her friend Anita are going to have a happy retirement. Omega plans to announce more details at a press conference this Wednesday, May 25, so check back with us for updates on their new home. We will also update you if more is found out about the people responsible for Lily’s condition.